The founder of The Church of Jesus Christ of Latter-day Saints, was born in Vermont and every year this site attracts thousands of visitors. Ask us about Vermont historic sites or share your Vermont historical information and comments. To feature your business, contact us. The polished granite shaft (shown above) marks his birthplace. The accomplishments of this extraordinary man are presented in two buildings located on the memorial grounds. View paintings, sculpture, exhibits, and films. 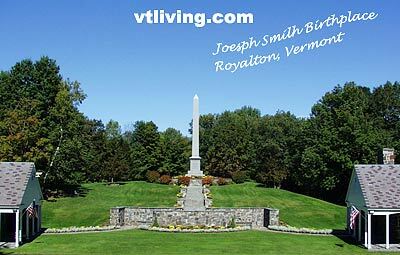 A picnic area and views of the Northern New England countryside offer an opportunity of relax and contemplate Mormon life. Guided tours are free.